Do you have trouble getting your kids to brush their teeth? Are you also worried about what is in their toothpaste? Tanner's Tasty Paste was created as a solution to both of these questions. 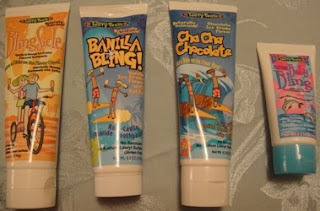 How do you think your kids would like a chocolate ice cream flavored toothpaste? And how would you like it if that toothpaste did not contain saccharin, sodium lauryl sulfate or any artificial colors or flavors? Ahh...so Tanner's Tasty Paste did solve your questions! Plus, Tanner's Tasty Paste does contain fluoride and xylitol, a natural sweetener that can reduce plaque. We first tested out Tanner's Tasty Paste in the Baby Bling flavor, because it does NOT contain fluoride and is safe for babies to swallow...which is something our twins will do since they are so young. It is supposed to taste like vanilla ice cream, and all I know is that is smells like vanilla ice cream and my daughter ate it right up. (Yeah, she doesn't brush so well...she more eats the toothpaste if she likes it.) We used to have such a difficult time getting the toothbrush near her mouth, but with Tanner's Tasty Paste there's no fighting! My hubby and I then tested out the Cha Cha Chocolate flavor. Really, I mean where can you go wrong with chocolate ice cream flavored toothpaste? Tanner's Tasty Paste comes in two yummy flavors--vanilla ice cream and chocolate ice cream. The toothpastes are saccharin-, sodium lauryl sulfate-, and gluten-free. They also have no artificial colors or flavors. You can get toothpaste either with fluoride or without, depending on the age of your child. Tanner's Tasty Paste is flavored with Xylitol, a natural sweetener that can reduce plaque. Tanner's Tasty Paste is about three to four times as expensive as regular toothpaste when you factor in shipping costs. Overall: We give Tanner's Tasty Paste a 9/10! How would you like to win one tube of each flavor of Tanner's Tasty Paste? First, visit the Tanner's Tasty Paste website. Then, comment here and tell me what you love most about it. 2) Follow @TannersTasty on Twitter and comment here with your Twitter screenname. 5) Become a fan of Tanner's Tasty Paste on Facebook, and be sure to let them know that The Twinners sent you! This giveaway will close on September 15, 2010 at midnight. We were sent four tubes of Tanner's Tasty Paste free of charge for the sole purpose of this review; no other compensation was received. All opinions expressed are my own. I loved the clickable link on Tanner's toothpaste web site. I found a local dentist that sells it! I love that they have cool names and one tastes like vanilla ice cream. YUM!!! !